Welcome to 2017, my friends! Today is typically the official start to 2017 in the working world and let me tell you, I’M READY! I’m ready to make this year my best yet – unforgettable, successful, fulfilling, and most importantly, fun! 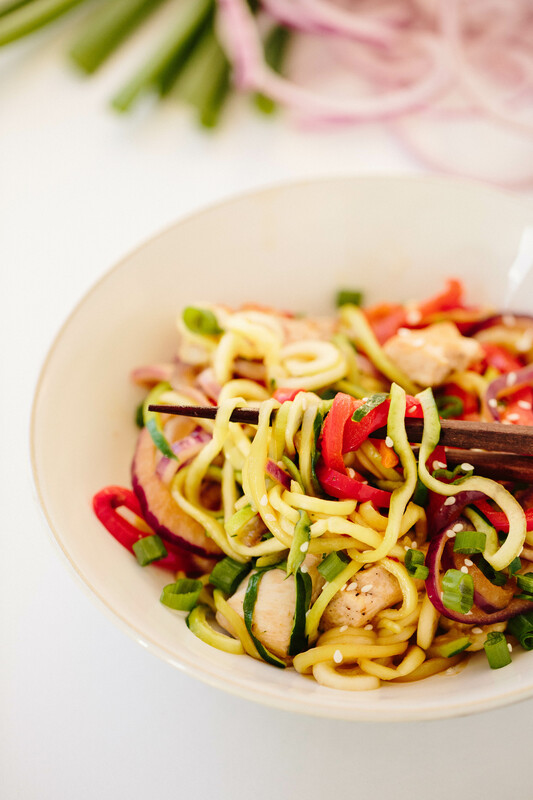 To start the year off, I’m sharing an easy stir-fry recipe with everyone’s favorite: zucchini noodles. It’s going to be hard to top yesterday. Yesterday, in case you didn’t see on social media, Inspiralized got a digital billboard spot in New York City’s Times Square. TIMES SQUARE. A BILLBOARD! Lu and I went into the city yesterday to see it in real life (it went up at midnight on January 2nd) and it was more exciting and impressive than I could’ve ever expected! It’s one of those moments where I said to myself, “You’re doing it Ali. Every single day, you’re building your brand, your empire.” It was absolutely humbling and just… surreal. Needless to say, it’s going to be hard to top that, but I am 100% confident that I will. The energy I feel moving into 2017 is like nothing I’ve ever felt before professionally. And more than ever, I feel the support, encouragement, and excitement from all of you – my Inspiralized squad! We’re starting an Inspiralized Cook-off Challenge series in our private (but free!) Facebook Inspiralized Community. 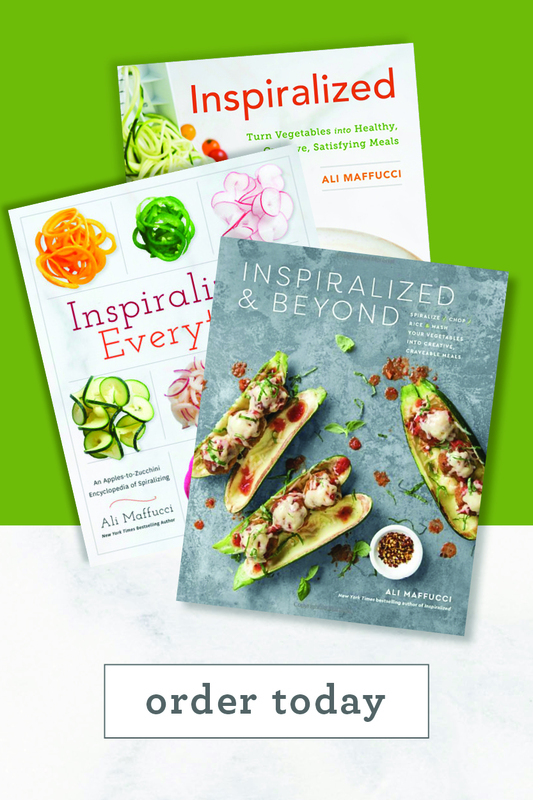 Every other month, you can submit your spiralized recipes based on the month’s theme (this month’s theme is your “healthy go-to spiralized recipe”) and then the recipe with the most votes will be re-created by me on this blog with a profile on YOU. I can’t wait to see what you all cook up! You can join here. 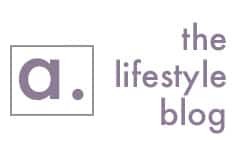 I added a new section to my blog which you can access by clicking on the top right hand side of the blog (with all of the rectangular colored boxes): Healthy Living. This is where all of my health posts will live. So many of you ask me about my personal journey, from a grocery haul to my workouts. I plan on posting them here. And more to come, of course. In 2017, I’m going to post my personal weekly dinner meal plans on the blog. You can follow along on Instagram to see my dinner each night. You can also find these in the Healthy Living page. 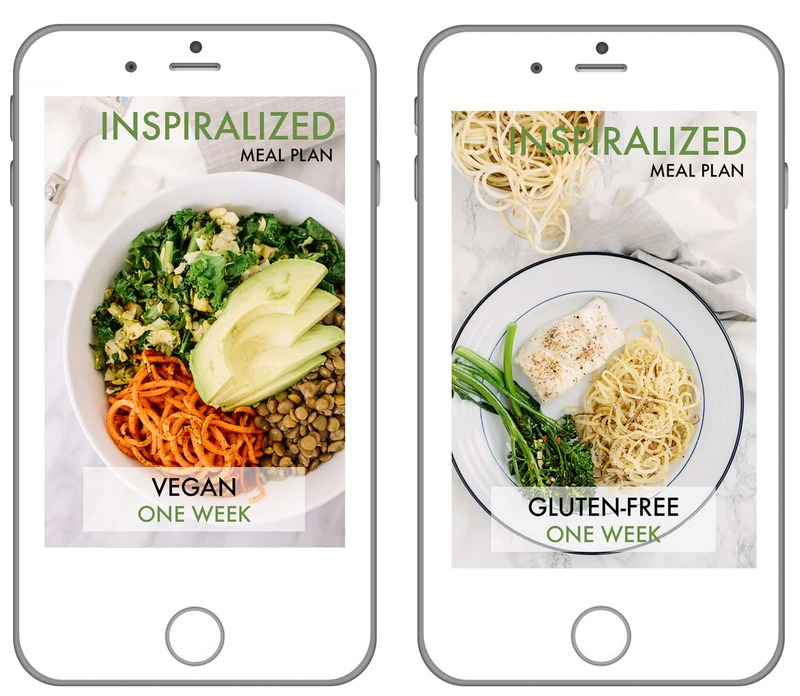 I launched Spiralized Meal Plans for those of you who like following a plan. In these meal plans, you’ll find full shopping lists along with step-by-step prep instructions. 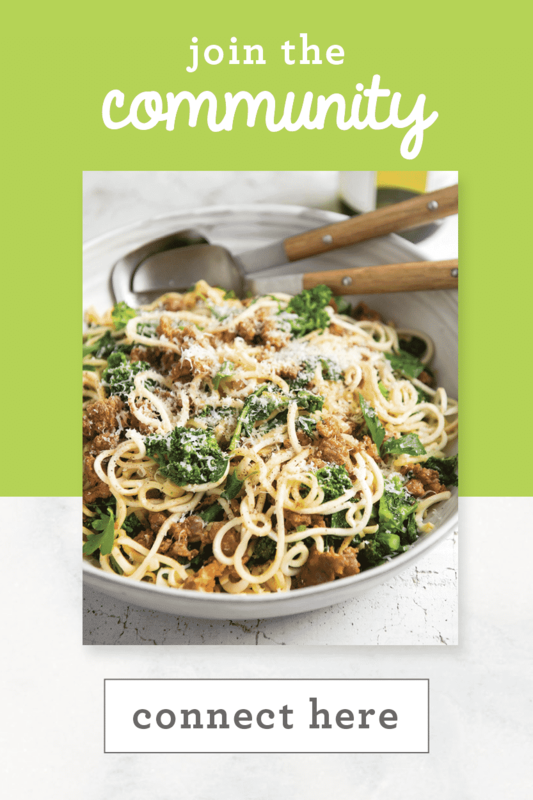 It’s a printable PDF with all of the recipes included. Click here to download! 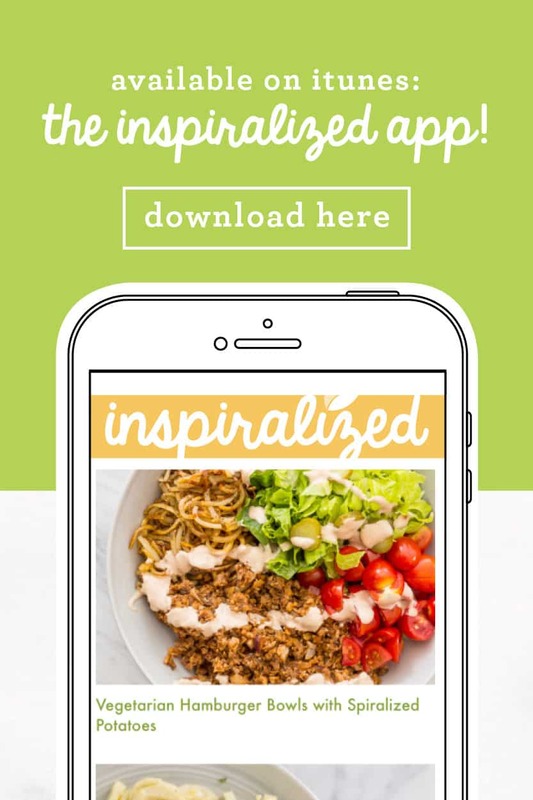 The Inspiralized App got an update. If you already own the App, make sure you’ve updated your iOS device to the latest version so it works properly. Also, make sure you update the App! The new feature? A Shopping List! You can now create a shopping list in the App, making grocery shopping even easier! That’s it for now! Make sure you subscribe to our mailing list for more exciting updates – I always announce there first. 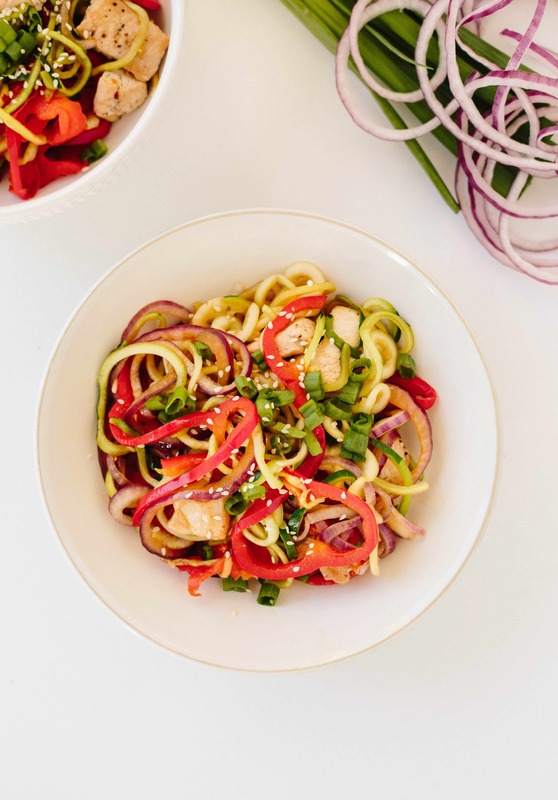 This recipe speaks for itself – it’s flavorful, a classic Asian-flavored stir fry, packed with veggies, color, and nutrients. 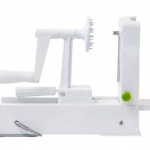 Try it with flank steak, shrimp, OR if you’re vegan, sub the chicken for edamame or tofu. 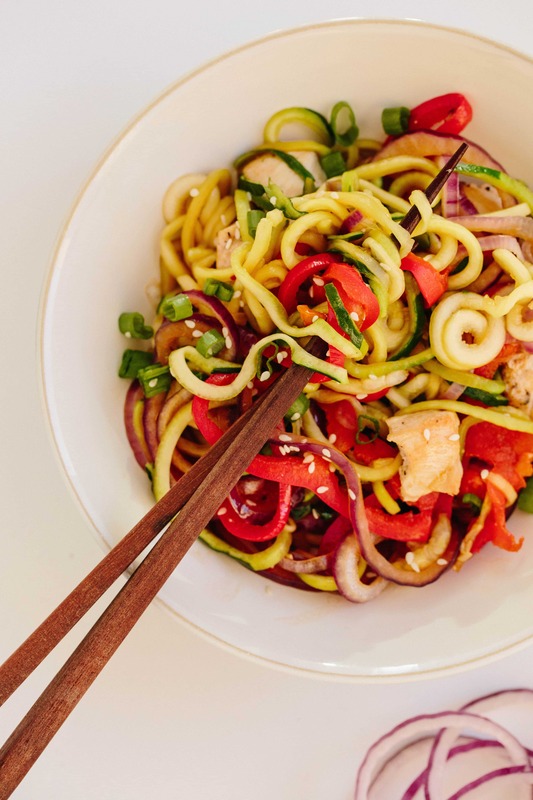 You’ll love spiralizing all the veggies for this stir fry – AND it’s easy to meal prep. Now… make this day, this month, this year YOURS! 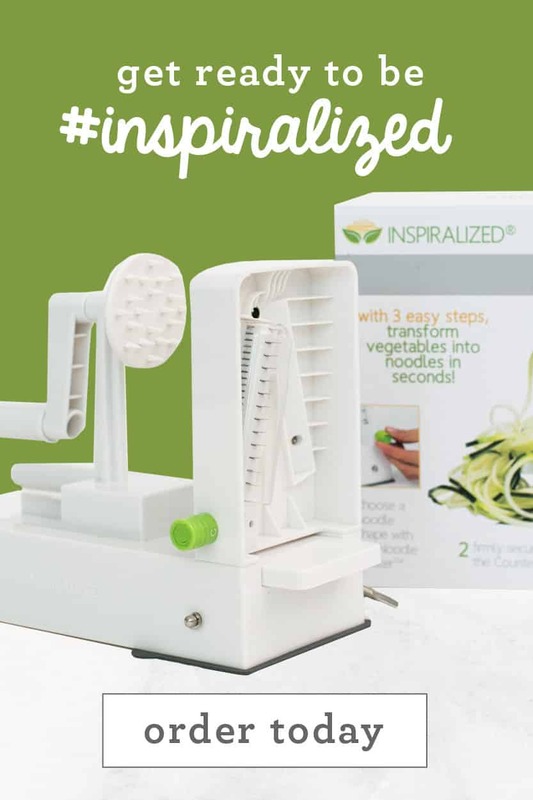 I challenge you to eat Inspiralized for a week and see how you feel! To launch the year, I’ve created weekly meal plans (Vegan and Gluten-Free) that will take the guesswork out of lunch and dinner for the week. 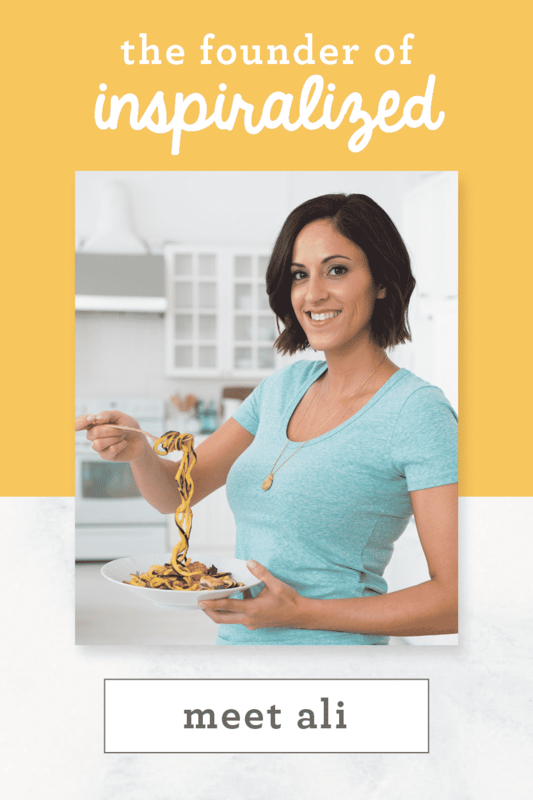 I encourage you to follow along with me – these are the types of weekly meal plans I made for myself when I was trying to lose weight – they’re full of vegetables, lean proteins, and you’ll feel like you’re eating something completely different every day. 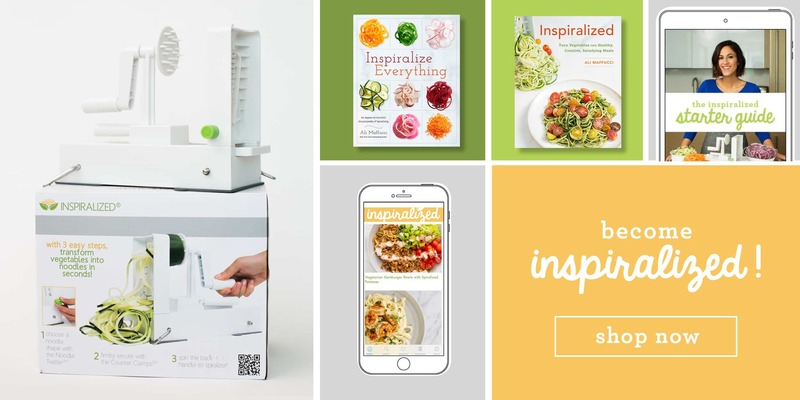 Join me and thousands of others over on the Inspiralized Facebook Community and motivate one another to keep on track of the meal plan – share images of your food, ask questions, troubleshoot recipes, and get excited about eating #inspiralized! Meaghan and I moderate this community, so you’ll see us check in everyday! Heat a wok or large skillet over high heat. Once pan is hot, add the oil and swirl to coat. Add the chicken, season with salt and pepper, and let cook for 2 minutes. Add the garlic, ginger, red pepper flakes, and toss for 2 minutes. Add the bell peppers, zucchini noodles, onions, soy sauce, and toss well to combine. Stir fry for 5 more minutes or until chicken is cooked through and veggies are crisp-tender. Divide stir fry into bowls and garnish with scallions and sesame seeds. Holly, since it's not a super watery sauce, it holds up better than others, but I'd definitely add an extra dash of soy sauce or some chili sauce to add more flavor when reheating, since the noodle swill release water and dilute the flavors! When I saw you make this on Snap, I knew I had to have it. I made it that evening! It was SOOO delicious, and my husband discovered that he likes zucchini noodles best with Asian flavors. It was a win win! Congrats to all your success, Ali! Looking forward to following you this year! SO happy to hear that! Thanks for sharing !! Made this today for lunch! It was delicious! Thanks for always coming up with great recipes! 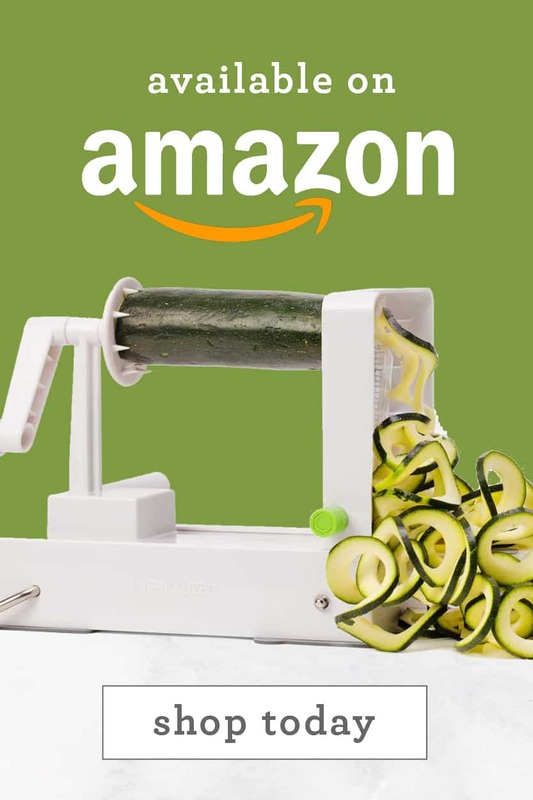 Hi Ali, If I want to make this ahead of time for lunch, is there a different veggie I can use besides zucchini? Maybe sweet potato? I know zucchini doesn't hold up well to heat especially after a day or two. Thanks! I had no luck spiralling the red pepper so ended up using my mandoline slicer, but I spiralled everything else, added chilli oil instead of red pepper flakes and made a cornstarch slur to thicken up the sauce. Great Flavours and texture.